Could China be witnessing the beginnings of its own end? The vast majority of commentators say the chances are slim. Indeed, most are as dismissive of China-sceptics as Nikita Krushchev was of USSR doomsayers in the 1950s. Yet within three decades of his ‘We will bury you!’ speech, and Yuri Gagarin triumphantly blasting off into space, Krushchev was proved wrong. History was not ‘on his side’, and the only grave that was dug was for the Soviet Union. Pull out a map of the Orient. Not a Chinese Communist Party (CPC) standard issue, but one drawn up for, say, Queen Victoria during ‘The Great Game’. Or Kublai Khan in the 13th century. Whether you go back a hundred years or a thousand, the image that greets you is strikingly similar: a much, much smaller ‘China’ centred on the heartland of the Han people, their ancient ‘Middle Kingdom’. Much of what lies within ‘Chinese’ borders today was not so long ago a mosaic of very separate, very non-Chinese states, from Xinjiang to Manchuria, Qinghai to Inner Mongolia, Tibet to Yunnan. Versions of the ‘One China, two systems’ mantra have been rolled out for centuries in an attempt to justify Chinese suzerainty over surrounding territories, but historically these regions were independent nations, and were only ‘absorbed’ by force. Travel around China today and once you leave the booming cities of the east, the picture becomes clear. Fewer people look ‘Chinese’, speak Chinese (either Mandarin or Cantonese), or act ‘Chinese’ (mosques instead of Mao, chortens - Buddhist shrines - instead of chopsticks). It is not so much ‘ethnic minorities’ living in ‘autonomous zones’, as CPC officials would have us believe, more non-Chinese ‘majorities’ whose homelands have been swiped from under their feet. The contrast with Beijing and Shanghai is stark, this despite millions of Han Chinese families being forcibly relocated to live in these regions, or bribed with government jobs to migrate. If (with hindsight) we can now talk of it being inevitable that the indigenous populations of Soviet Republics like Kazakhstan, Uzbekistan and Tajikistan would one day seek self-determination, is it so hard to believe Tibetans and Uighurs won’t do the same? Or that Inner Mongolians might wish to be reunited with their ‘Outer’ cousins? China may not face the threat of a Cold War, yet it is still embroiled in major conflict. Trump, Putin, even Kim Jong-un could be role-called as potential adversaries, but foreign opponents are the least of the Party leaders’ worries. The reality is they are already at war on three ‘home’ fronts. Xinjiang This is the name (Mandarin for ‘New Frontier’) given by Chinese rulers to the enormous province that makes up the north-west corner of modern-day China. However, a significant minority of the region’s (primarily Muslim) inhabitants still use the old ‘East Turkestan’ or ‘Uighurstan’ (a modern variation). The area’s history is one of mixed fortunes. 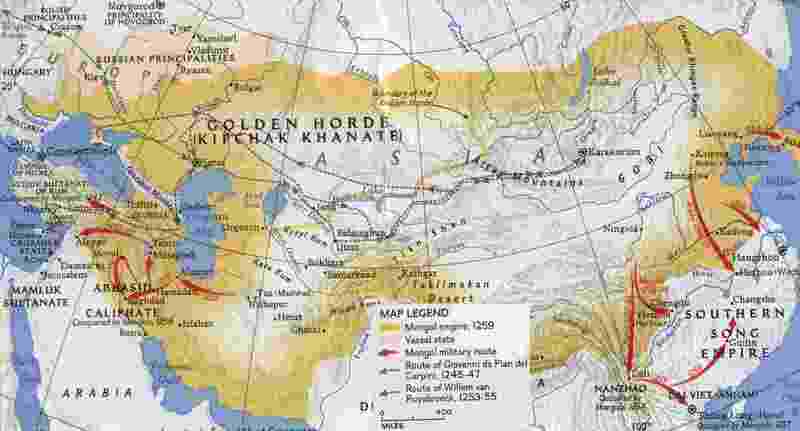 At times it was made up of rich independent kingdoms (Khotan, Kashgar and Kucha). In other eras it formed pieces of larger pies (the ‘Altishahr’ of the Tarim Basin, the Chagatai Khanate of the Mongols, or the Karachanid Empire of Transoxania). Chinese annals routinely state that ‘local’ rulers only held power at a ‘local’ level, remaining sub-ordinate to Chinese emperors in the capital, yet records on the ground beg to differ. Put simply, the peoples of this region rarely considered themselves to be part of China, let alone ‘Chinese’. As recently as 1944-9, East Turkestan existed as a fiercely independent republic. Tibet The Tibetan struggle may be the most peaceful ‘war’ on the planet, but that shouldn’t be taken as a sign of weakness. Moreover, the cause, headed by the Dalai Lama, enjoys the sympathy of the broader international community, not to mention a legion of celebrity supporters. Ethnically and culturally, Tibetans have always been completely at odds with their Chinese neighbours. In 1949 The People’s Liberation Army of China marched into Tibet to ‘improve’ the region. Its victory at the Battle of Chamdo in 1951 was meant to bring Tibetans into line, but a large-scale uprising took place in 1959, and tensions have simmered ever since. Recent protests have again turned violent and sometimes deadly, most notably in 2008 and 2012. It is important to remember that the Tibetan Autonomous Region as defined by the CPC represents only a fraction of the territory claimed by a fully-functioning Tibetan ‘Government in Exile’ operating out of Dharamsala, northern India. Much of the modern Chinese provinces of Qinghai and Sichuan were historically part of Tibet proper, and are still primarily inhabited by Tibetans, this despite approximately 150,000 Tibetans joining the Dalai Lama in exile. They have all vowed to return. Taiwan Technically, China is not at war with this ‘nation’ but that is only because Taiwan has never formally declared independence. If Taipei does, Beijing has vowed it will launch an immediate military attack. As recently as March 2017 Taiwan’s Defence Minister talked of ‘warfare’ techniques necessary to combat threats from mainland China. With hostilities in the South China Sea steadily increasing, and Washington regularly using Taiwan as a bargaining chip in its negotiations with Beijing, developments in Taipei could yet be a major catalyst for change on the mainland. If economics as much as politics proves instrumental in the unravelling of modern China, Hong Kong looks set to hold the key. Since the return of the former British colony to China in 1997, Beijing has made every effort to integrate it into the mainland economy, but fundamental obstacles remain. Protests regularly denounce Beijing for reneging on promises, and have become more and more strident. What were once thought to be economic differences are increasingly taking on a political bent, with many ‘islanders’ demanding full democratic rights and an end to the one-party system. Significantly, dissent (mostly aimed at corrupt party officials) is spreading across southern China. Some protestors come from ethnic minorities but many are Cantonese- or Hokkien-speaking Han. These people may share ethnic and cultural ties with their Mandarin-speaking cousins in the north, however those living south of the Yangzte River have long considered themselves ‘different’. Traditionally this might have only manifested itself in a preference for rice over noodles, but with the political and economic tensions increasing year on year, the debate is now about more than what food is on the table. Ultimately, Beijing hopes economic investment in the provinces will convince local inhabitants that life under CPC rule is preferable to any break-up. In particular, President Xi Jinping is staking billions on his ‘One Belt, One Road’ initiative, aimed at creating a ‘New Silk Road’ to transport trade and prosperity throughout China, and beyond. A vision in which rail links, superhighways and pipelines replace camel caravans of old. Nevertheless, an increasingly volatile economy (in May 2017 China’s credit rating was downgraded for the first time since 1989) could still push the world’s new ‘superpower’ close to the edge. A ‘9/11’-type terrorist event might tip it over. Perhaps, under such circumstances, the Han Chinese will be calling for their Uighur, Tibetan and Mongol ‘compatriots’ to be cut loose. After all, throughout history this is a country famous for repeatedly turning its back on the outside world. Tellingly, Stalin also ordered mass migrations, sending thousands of native Russians to ‘modernise’ his newly created Soviet Republics. Yet following the 1991 break-up of the USSR the vast majority of families quickly returned, even though some had never set foot in ‘Mother Russia’ in their lives. Subsequent Soviet leaders similarly tried ‘economic solutions’, but Perestroika and Glasnost proved too little too late. Will China collapse tomorrow? Probably not. In the next 30 years? Ask Mikhail Gorbachev.